Please send me more information about Magnolia Creek Apartments. This beautiful property is located in The Creeks of River Ridge. Magnolia Creek is a River Ridge, LA apartment community that is convenient to Earhart Expressway, the Huey P. Long Bridge, Downtown New Orleans, Elmwood Business Park, entertainment and shopping. Our location is also ideal for individuals attending local area universities such as Tulane, Loyola and Xavier. Our one and two bedroom apartments feature full washers and dryers, personal intrusion alarms, Roman tubs, wood burning fireplaces, private patios or sunrooms with faux-wood flooring. Fully equipped kitchens, extra large walk in closets and detached garages make Magnolia Creek a must see. Once you enter through our gatehouse entrance, you can see for yourself how we have brought you a new level of luxury and contemporary living to one of the area's favorite locations. We have come to find out after comparing our fine amenities package, we're sure you'll agree that we provide the very finest in quality in our apartment homes. Let our professional staff show you how luxurious living can enhance your lifestyle. INQUIRE ABOUT OUR FURNISHED/CORPORATE APARTMENT OPTIONS. Great place to live. Very quiet and nice apartments. Hillary in the Rental Office is such a kind person always willing to help. Only bad thing? Parking problems: too much cars, and not much parking places. Also, because is not assigned, you do not have guaranteed availability. I have been living here for about 2 years and haven't had any major problems other than the usual wear and tare. Maintenance staff is always quick and helpful. Kudos to Mr. Frank, Cindy. However my neighbors above are a different story; a couple of times they were fight from 3am til 5:30am. The stomping can be annoying but the loud intimacy could be down right rude and disgusting. No respect for others sleep pattern nor their children in the next bedroom. Overall a good place to live near airport, shopping centers and restaurants. Rent is a little high, but what can you expect it's metro New Orleans. Magnolia Creek Apartments If you are looking for a nice quiet community with access to great restaurants and outdoor space (such as a playground and pool) then this may be the place for you. The staff is kind and efficient. The common areas are well maintained and as a result the scenery around the apartment is beautiful. Although it is outside the city limits, it gives you a chance to escape the everyday hustle and bustle of city life. Yes! I have lived here one year, and I love it! There's so many places to shop nearby, and Metairie, New Orleans AND Kenner are just a 5 minute drive away, in their respective directions. Everyone who works at the Creeks is nice. Maintence is as easy asking for help, there's a library of movies to rent for free, and the pool is always clean. There's a fireplace and washer and dryer in the apartment, and my place even comes with a balcony area. I'm a college student, so it's a little pricey for me, but along with the amenities, it's safe, so it's well worth it. You won't feel like your up a creek here The Creeks of River Ridge make me feel like I am on vacation, at home! The lush surroundings and the pool create an atmosphere that I want to come home to. The apartments are quiet, the neighbors respectful and cordial. The staff are more than accommodating. The apartment layouts are varied enough that I had options to choose from. The convienence of the location help me get to just about every place I need to go quickly. Located at the end of the Earhart Expressway, I can get to all of the Elmwood shopping in a flash, as well as into New Orleans with very little traffic. I have searched for a better location since moving here and I'm satisfied that I have found the best deal and location here at the Creeks of River Ridge. I would highly recommend Magnolia Creek! I am a college student who needs peace and quiet to study and this place definitely offers this! The staff and maintenance are great! Awesome location which is not too far from the city and conveniently located within 5 miles of great shopping centers!! Love it here! I would highly recommend Magnolia Creek to anyone looking for a quite, cozy, comfortable place to live! I am a college student who needs peace and quite for studying! I love living here! Great location that's not too far from the city (15 minutes give or take) with lots of convenient shopping centers located within 5 miles! Maintenance is great! The staff is very friendly and very helpful!! I would highly recommend Magnolia Creek Apartments, due to the friendly staff and maintenance workers. The grounds of the apartment feel safe and are well kept up. I fell in love with high ceilings and the fireplace. Elmwood is beginning to build more businesses in the area, which make River Ridge a nice place to live with lots of places to eat and shop. Its a plus to have nice neighbors as well. Here is the real deal about Magnolia Creek reviews... If you have noticed that a lot of these reviews have been 5 and 4 stars, WELL the apartment managers selects random attendents monthly to post reviews about the complex. And if the reviews are good then the person recieves a $300 saving on his or her rent. CONS: -The people living in the surrounding apartments are rude and disguting. 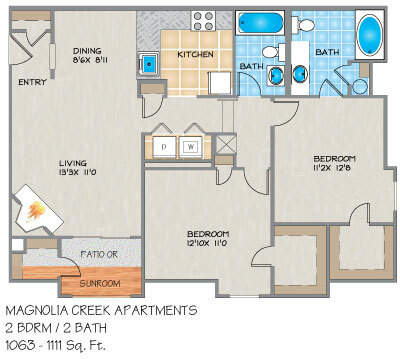 Understand that Magnolia Creeks is just 1 out of 5 or 6 apartments in this complex. So if your going to move here you have to endure the nonsense of others that don't even live in your apartment building. -The walls are thin, and I can hear every tv show that the person above me is watching and their hyperactive children playing, running, rough housing, or arguing. -The dumpster sites are nasty, the landspcaping team needs to power wash those things every once in a while. -The rent is to high for what you DON'T get. I pay $1125/month. For no exercise equipment, no business center, no gate access, no parking spaces available after 7 or 8. -If you live here you will start seeing really old cars that have not moved from their parking spot for a very long time... such a long time that webs start to grow underneath them. -Don't be excited over the gatehouse! The person who is Security (and I use that word very lightly) does nothing. If you ever want a job that you don't have to do anything but literally sit and watch cars go by, then you should be a security gaurd at The Creeks. -The front fountain does not work... an eye sore for anyone who comes into the complex, and maintence needs to replace the freaking light covering in the front left of the useless gatehouse. It looks ghetto. -The landscaping crew should trim the bushes near the parking spots. Some are so overgrown that you won't be able to get out of one side of your car. PROS: -Maintence is very helpful -Having a fireplace is pretty cool - ... that's it. OVERALL I give Magnolia Creek 3 STARS. Pros of living at Magnolia: 1)Very nice apartment space... I love the fireplace, even though I will probably never use it. It's just cool to know that I have one. 2)Close to the Elmwood shopping plaza and the AMC theater and a whole lot more stuff that I don't even have space to list. 3)The staff is extremely nice, which is definitely a breath of fresh air. 4)Very nice closet space, and nice size bathrooms. 5)I love my sunroom, it gives additional space to the living room. 6)Having a washer and dryer in my apartment is great... though the units are old they still do the job. I haven't tried the dish washer though, I'm more of a wash my dishes kind of person Cons of living at Magnolia: 1)I have no problem finding parking when I get home from work (around 4:30ish), but any later then you will be parking on the curb, which is really not a pleasant appeal. For some reason it annoys me. 2)Make sure you do not have a family with little kids living in the apartment above you. I can hear little kids shouting and running across my bedroom ceiling when I'm trying to go to bed. Put those little monsters to BED! 3)The dumpsters are not really maintaned. The gate to the dumpsters will sometimes be open and people usually don't care where they put there trash. So you might see broken bottles on the ground. The apartment is very nice, the management can work on the grounds but they are okay. Being a new person to the NOLA area it's a nice beginning, but I am always searching for new and better places to live (that's just how I am). For some reason I don't like paying $1125 a month and hearing the kids that live above me. If possible, I will continue living here in my beautiful surroundings after retiring. It is my home and the staff here at Magnolia has been available and helpful for all these many years. They are like extended family. My neighbor below my apartment has been here almost as long as I have and we consider each other friends. That's rare in such a large complex. The grounds are lovely. When I drive in the boulevard each day after work, it's the start of relaxation. The grounds are immaculate; the magnolias are blooming and the fragrance is delightful. Most importantly, the staff gives any request their immediate attention and resolve issues if needed. I hope Sandy stays in the office as long as I am a resident. She is great. Magnolia Creek is a great place to stay. It is nice and quite, and is also located near places to eat and stores. I moved to Magnolia Creek in 2009 shortly after moving back home from Atlanta and I must say that from the begining until now I have enjoyed living on this property and and interacting with such friendly, courteous, and welcoming staff. I rent is very attractive based on the area and I have had no issues in the 2 years I've lived here. I would highly recommend this property to others. I have lived in the Magnolia Apartments since before Katrina. All of issues (which have been few) were fixed in a very timely manner. The employees are extemely pleasant & very polite even in stressful situations. Sandy, Ashley, Mark & Frank are the best at their jobs & deserve "props" for being in an industry that doesn't always recognize the good things!!!!! I will being staying put for many more years to come!!!! I love living at Magnolia Creek. My apartment is nice and cozy. If I need anything fixed or taken care of, it is usually done very quickly. The grounds are nice and pleasant. The landscaping was just redone and the area looks really nice. I love the creek running through the property. The office staff are always helpful and friendly. I was very impressed when I first moved in when the staff knew my apartment number without me having to say anything. It proves to me that they take the time to get to know their residents. I would recommend my apartment complex to anyone.